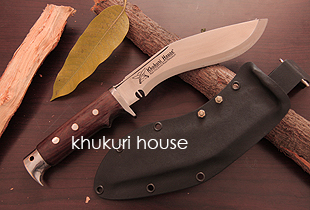 Here is the much awaited Khukuri blade from Khukuri House with Kydex scabbard. With its addition, the Khukuri now becomes a complete "Survial knife" a Survivor or a Adventurer needs. Alas "It is here". Mini Supreme is very much alike to Mini supreme but with a small improvisation added on the very start of the blade from the handle, on the spine of the blade, a Rigged surface dug in where one can place his thumb and have more control over the blade for cutting ropes or for similar tasks.